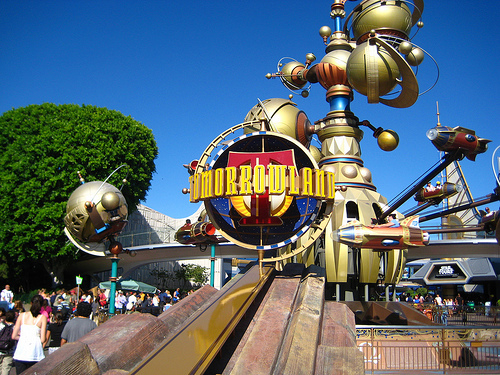 The Lands of Disneyland: Tomorrowland! Today we continue our look at the lands of Disneyland Park. Of the eight lands, we’ve covered six of them, and the only two left to look at are Tomorrowland, that we are focusing on today, and Mickey’s Toontown! Like Fantasyland, there is a whole lot to see and do at Tomorrowland. Just take a look at this attractions list! There are a lot of great attractions, so I won’t touch on all of them, but I will highlight the ones I liked the best, and think you will too! Sophie didn’t have much fun on Space Mountain! Of course I’ve got to start with the best attraction in Tomorrowland in my opinion! I don’t have much in the way of photos, but I do love our ride photo that they displayed. 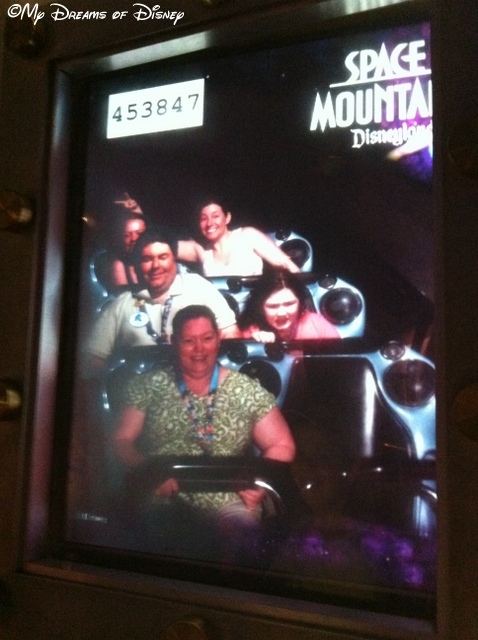 Cindy loves Space Mountain, Sophie, not nearly as much, and I’m along for the ride, but I love the two behind us! The big difference here is that Space Mountain at Disneyland is two seats across and Space Mountain at Walt Disney World is single seats. It was the two seats across that was the only reason Sophie decided to try it out — but she still doesn’t like it! 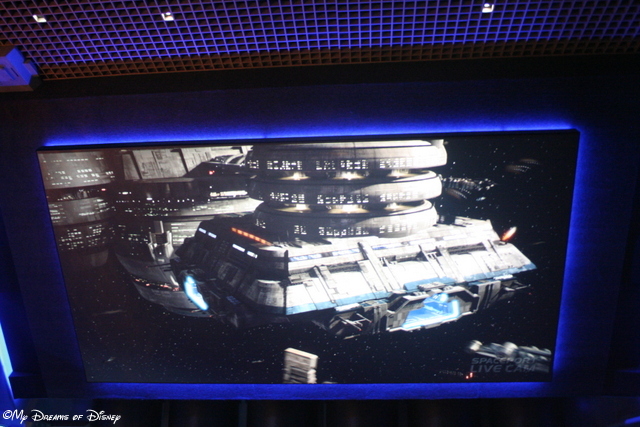 Just like Walt Disney World, Star Tours is a great attraction! I call this a fringe Tomorrowland attraction. 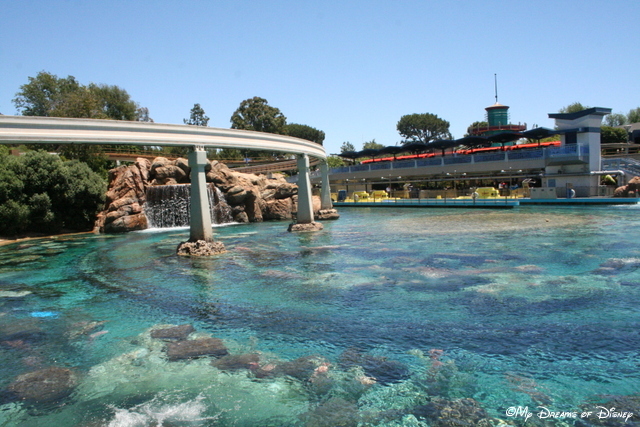 Officially, Finding Nemo Submarine Voyage is a Tomorrowland attraction, but to me, it feels more like a Fantasyland attraction. I think that it does to me because of the inclusion of the Finding Nemo part of the journey, if it was 20,000 Leagues or so, it would definitely be a Tomorrowland attraction. In any case, it’s all apples and oranges, what matters is that I like the attraction — I hadn’t ridden in a “submarine” in a really long time, and it was fun to see it go on a voyage searching for Nemo! The Autopia, in my opinion, is better than the Tomorrowland Speedway. 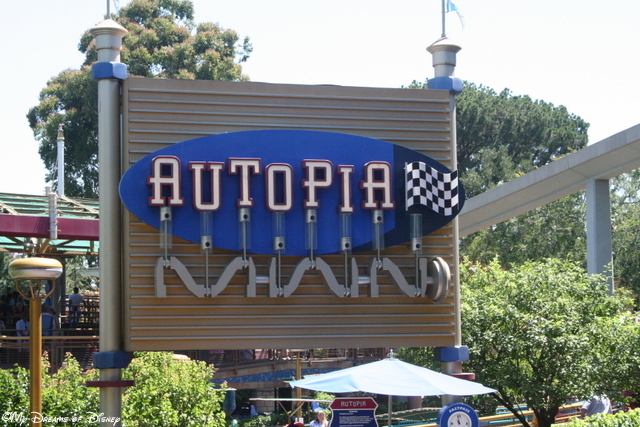 You know, I didn’t really have any intentions of riding on the Autopia, but Sophie wanted to go and drive her own car, so Cindy and I went also. I’ve got to say that I think the Autopia is better than the Tomorrowland Speedway in the Magic Kingdom. One thing that I definitely noticed was that the smell of gasoline seemed like it was less at the Autopia than in Florida, maybe it is, maybe it isn’t. But that’s how it felt to me. 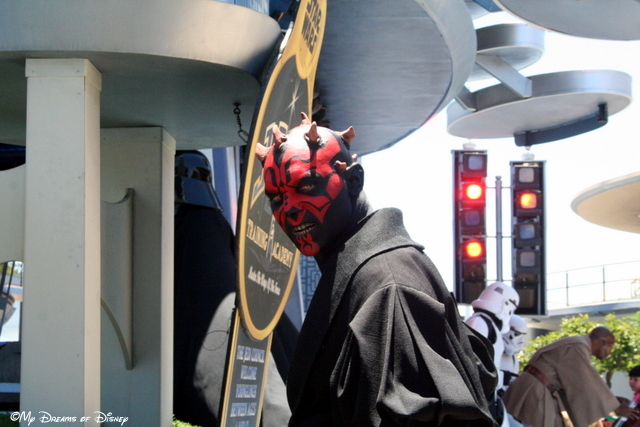 Darth Maul keeps watch at the Jedi Training Academy! I’m going to close out our exploration of Tomorrowland by taking a look at the Jedi Training Academy. This is something we’ve never done before at Walt Disney World, and truth be told, we didn’t do it at Disneyland either. However, we were at lunch when it started up, so we watched it to see what it was like. At one point in the show, Darth Maul jumped over at some of the other people watching and eating their lunch, and scared quite a few of them! It was great. I don’t know if it’s the same at Walt Disney World, but if it is, then we will definitely go watch it again one day! It was one of my most enjoyable experiences we had at Disneyland. Thank you for stopping by to visit today as we explored Tomorrowland, one of the lands of Disneyland. Our last stop on our tour is Mickey’s Toontown, so look for that in the next couple of days! Thanks, and remember, at My Dreams of Disney, it’s our goal to turn My Dreams of Disney into Your Dreams of Disney! On this Sunday before Christmas, let’s take a moment to remember the most important part of the season. Merry Christmas, my friends! Today is the Sunday before Christmas, and like you, I’ve been spending some time looking for and buying presents for the loved ones in my life. However, one thing I’m trying really hard to make sure I don’t do is putting the secular celebration of Christmas, with Santa and all of that, before the true reason that I and my family celebrate Christmas — the birth of our Lord and Savior, Jesus. His birth is the ultimate expression of love that God has for us. God sent His Son Jesus to earth in the form of man to pay the ultimate penalty for our sins — and Jesus did so willingly because He loves us. For us in the 21st century, it truly is an act of faith to believe that this happened. I believe, and I think you believe also — and it is because of that belief that you and I are saved on this day. 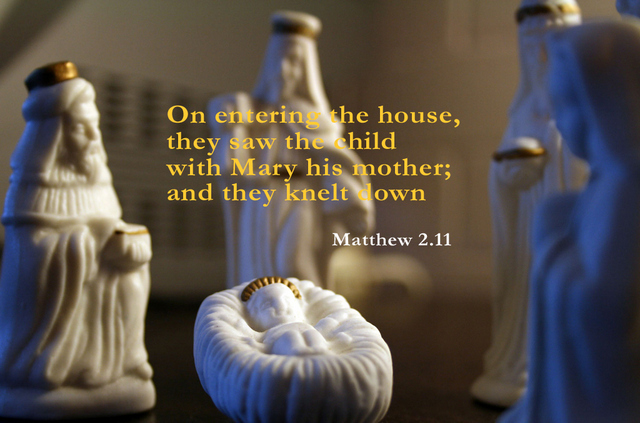 So, my friends, while it is perfectly okay to celebrate Christmas with the exchanging of gifts, and seeing what Santa brings us, and all of that, it’s equally important that we not forget exactly why we have Christmas to begin with — to celebrate the birth of our Savior. Lord, first and foremost, we have You and the birth of Your Son Jesus to give praise for — without Jesus we all would still be slaves to our sin — and even if we struggle with it, we know that through Jesus we are saved, and our sins are forgiven when we ask You to forgive us. Cindy’s Uncle Ted is doing quite well, and he was able to have his treatment on this past Monday and now won’t need a treatment until after Christmas! Thank you God for all that healing that you are giving to Uncle Ted, and please keep Uncle Ted and Aunt Connie safe and continue to heal them as they need it. Lord, we were able to celebrate with family twice this past week, and it was a great, joyous time both times. Thank you Lord for giving us family that we can visit and love and laugh and cry with, and please keep them all safe this Christmas season. Lord, thank you for putting it on all of our hearts — Christian and non-Christian — to be caring of our fellow human beings. Lastly, Lord, thank you for the wonderful gift of music that you have given Sophie — our Christmas concert this past Tuesday was a blessing to listen to. Lord, also, thank you for making Sophie’s transition to braces fairly easy. Please pray for my friend Vickie. Here is what she wrote: Mike I have been having severe pain in my jaw for a week now. Both the my dentist and doctor have failed to stop the pain. It has kept me from work as it becomes so severe I can not concentrate on driving. I drive a semi so being able to keep my mind on the road is important. A change of careers may also be needed. I pray that God will lead me to the solution of my pain and open up a door if getting off the road is what I need to do. God, thank you for putting services such as Facebook to work for good instead of evil. It was through Facebook that I learned of a senseless death and accident at the hands of a drunk driver. The blessing is that it didn’t result in more deaths, although it certainly could have, but at this point, please pray for all the victims, but especially for the salvation of Cynthia Kirk, the 64 year old lady who died that night. Here is what I wrote as a comment to Jeffrey Sherman, who, along with his wife, were eye-witnesses to the death from about a foot away. If you haven’t heard about this, you can click on this link to read all about it. A word of caution, you will be able to visualize it all because of the poignant writing of Mr. Sherman. Lord, I know that there are a lot of other prayer requests out there that I don’t know about. Lord, please hear those prayers — those calls for mercy — and lift up the afflicted and grant them Your Peace. It is in the name of Your Son Jesus that we pray. Amen.